Back on the road, again. Surprisingly, driving east to west across the middle of California is really no more scenic than driving west to east. Who’d a thunk it? Today’s trip would see us departing the wonders of Yosemite and arriving at the brand new wonders of Big Sur. Between us, Mary and I have lived in California for a period that can be counted in decades, if you want to count it like that, which I don’t. 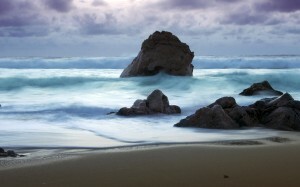 So suffice it to say, we’d been around the Cal block a few good times, and yet neither of us had ever been to Big Sur. And after perusing the prices, I can see why. If you’re not driving either up or down the coast to Big Sur, you’ve really missed out. On the Pacific Highway, the scenery is pretty spectacular in a heart-stopping kind of way. Along the coast, the highway is subject to frequent landslides, incredibly sharp curves, and of course the biggest scourge of all – other people. Who think nothing of skidding to a halt so they can take a quick picture of a rock in the ocean, because when do you ever see something like that, right? Well, we didn’t do that drive, at least not until the last twenty miles or so. No, our drive was mostly though another big band of industrial agricultural land, so pretty much deadly, deadly boring. Though we did get a chance to go through Gilroy, Garlic Capital of the World, so we have that. No garlic festival today, so no garlic ice cream. I am a sad panda, for many, many, more reasons than a lack of garlic ice cream. Once you get closer to the coast it does get much better scenery wise. We stopped for some gas, a bathroom break and a quick bite to eat at Casa De Fruta. Now Casa de Fruta isn’t just one of your everyday, multi-acre food, fruit and souvenir stands. Oh, no. There is so much more. Like Casa De Wine, with wine tastings, and not just any old, commonplace wines made from grapes, but exotic wines with fresh fruit flavors like apricot, blackberry, cherry, pomegranate, raspberry. Hmm, raspberry wine. 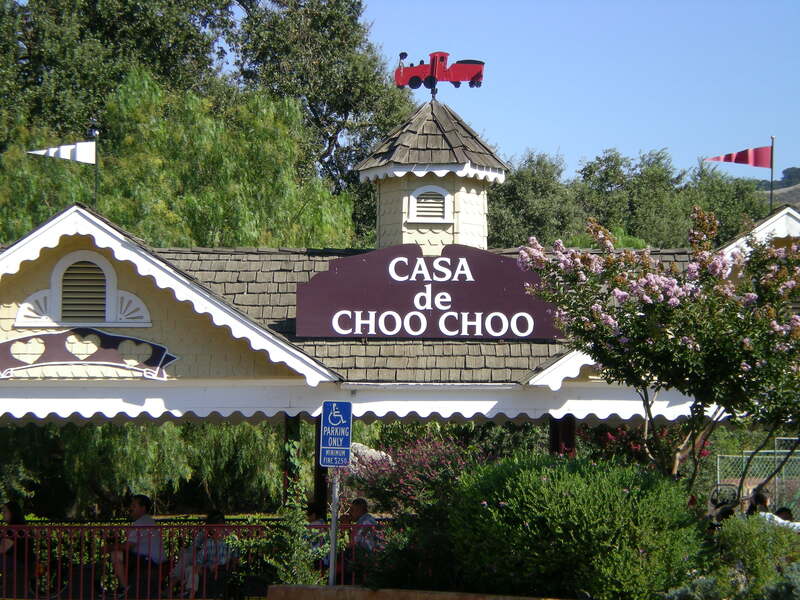 There’s also Casa De Carousel and Casa de Choo Choo, to meet your every entertainment need, as long as those needs are specifically for a carousel or a small train. 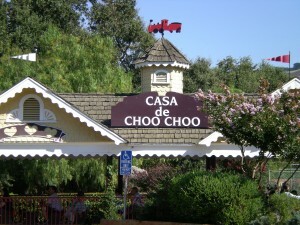 There’s a restaurant, Casa de Restaurant, like you had to ask, and of course, the ever popular Casa de Restrooms. Now we tend to measure all large fruit stand/restaurant/gas station/coffee shop multi-attraction tourist stops by one simple criteria: Do they sell mummified baby alligators? If they don’t, they’re distinctly second rate. I’m afraid Case de Fruta doesn’t make the grade, as there were no mummified, nor stuffed, not even a single freeze dried alligator to be found. On the other hand Casa de Fruta does host the Northern California Renaissance Faire every year, so there’s that. I suggest that if you’re in the area and are looking for someplace to get a burger, some dried apricots and Cajun spiced almonds it’s worth dropping by, unless of course you’re travelling through in during Ren Faire season, in which case it’s best if you go as far and as fast as you can in the opposite direction. After the Casa de Fruta, we were afraid that Big Sur was going to be a big let down. And it kinda was. No Ren Faire and no scale model trains. There was the ocean view, and the mountain views, and the fog rolling in across the sea to lap at the cliffs falling down to the water. And a nice fireplace and a hot tub to watch if all from. Because it’s kind of obligatory in Big Sur that you do the hot tub thing, with a glass of wine, or three, of course. It’s like the Seventies never died. Which is one of the most terrifying things I think I’ve ever confronted – Zombie Seventies!